The Episode starts with Dadi telling Purva that Dadaji used to keep nirjala fast today. Purva asks why? Vedant tells about the day. Dadi asks her to keep the fast too and make kheer. Purva says I never have trust on fast so I never kept any fast before. Pankhudi says didi can’t keep the fast. Sumiti says how she can fast in this age. Dadi says change is part of life and I am sure that you will keep the fast. Pankhudi says if Didi can’t keep the fast, then I will keep. Dadi says only bahu shall keep the fast, not you. purva says I can’t act and tells that she can’t keep fast. Gomti tells that Purva is married, but yearns for her boyfriend all the time. Purva gets up shockingly. Dadi scolds Gomti. Gomti says I have the proofs and plays the recording in which Purva told that she can understand her pain, and tells that she was sitting on the bride when Rahul left her. When Gomti asks, Purva tells that he was her first love and she remembers him even now. Vedant gets up shockingly from his seat. Purva says I shared my pain with you as a woman and says what wrong did I do with you. She says it is good that Preetam ji got saved. Gomti calls her naagin and asks what you and your husband do to break my marriage with Preetam. She shouts and asks her to tell. Dadi says we all are celebrating mahashivratri together and your babu ji might be seeing everything. Gomti says babu ji might not be watching. Dadi slaps Gomti. Gomti tells Purva that the slap will prove costly to her. Purva says sorry. Vedant says did Bua ask you not to keep fast and hurt Dadi. He says if you had agreed then this tamasha wouldn’t have happened. Purva says if I know this before then I would have told you before. Ramesh tells Gomti to ruin Vedant’s plan and says what did he think that he did a deal. Gomti asks him to tell everything truly. Ramesh says I have understood and asks her to hurt Purva to hurt Vedant. Gomti says you are saying right and tells that maharani has ruined her life and got Dadi slapped him. Purva apologizes to Dadi for not keeping fast. Dadi tells her about Vedant. Purva asks shall I make kheer? Dadi asks her to make kheer and says it is your house afterall. Pankhudi comes there and hides the plate from Dadi. Dadi leaves. Pankhudi asks Purva to have kheer. Purva says she can’t have food as she is keeping fast. Pankhudi tells that she has brought food for her and tells that she has kept fast on her behalf as she is half wife to Vedant. She tries to feed her forcibly, but Purva refuses to eat. They go to kitchen. Gomti see them going. Pankhudi tells Purva that Gomti will ruin her hardwork and kheer. Purva says she will change the labels and then her face will be good to see. Gomti hears her and thinks this is your last laugh. Dadi asks them to bring the garlands etc. Ramesh comes there calling Manjula. He then sees Vedant and asks her to hurry up for shopping. Sumiti scolds Narendra. Narendra says he might be possessed. Manjula comes. Ramesh compliments her beauty. Manjula gets emotional and teary eyes. Vedant asks Manjula why there are tears in her eyes. Ramesh wipes her tears and says you are always beautiful. Dadi compliments manjula’s beauty and nature. They leave. Dadi asks Vedant if the happiness will always be there. Gomti comes and adds sugar to the kheer thinking it as salt. Purva says it was sugar only and she didn’t add sugar in the kheer. Gomti tastes the kheer. Purva comes out and tells everyone that Gomti tasted the kheer before she could keep for bhog. Gomti refuses. Purva shows the video in which Gomti is seen adding sugar to the kheer. Dadi tells Vedant that happiness will not be in the house where people hate each other. Vedant is upset with Purva. Purva holds his hand. Vedant tells that he has hopes from her. Pankhudi asks Purva to go and meet Rahul, and asks will you let your first love go. Purva gets thinking. 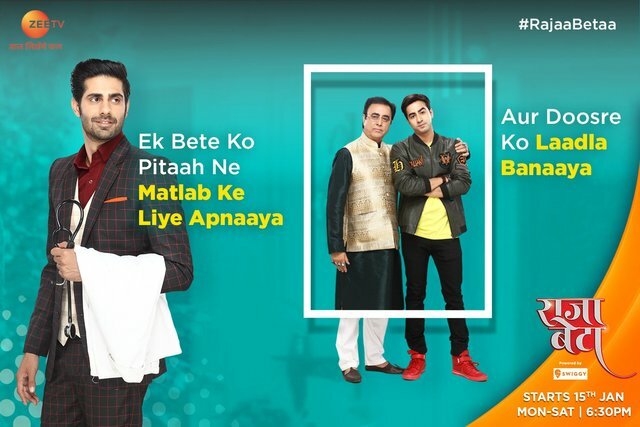 The post Raja Beta 4th March 2019 Written Episode Update: Purva decides to keep fast for Vedant appeared first on Telly Updates.